We ate three days of this meatloaf. The first day we had it next to a salad, the second day I used the leftover meat and the leftover vine leafs to make dolmades and the third day, when I wasn’t home, my boyfriend ate the leftovers. A bit too much probably, three days in a row but if you have a freezer you won’t have this problem. The meat is fruity because of the raspberry ketchup and the berries and the vine leafs add a great extra flavor to the whole. 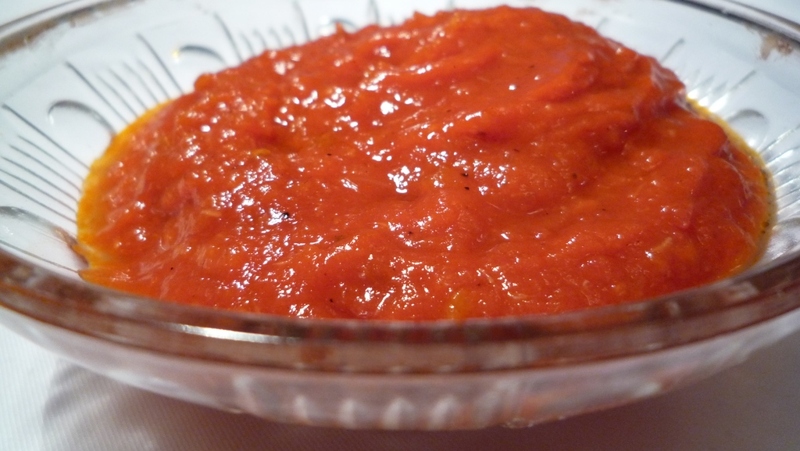 Making the sauce is very nice to do; it tastes so much better than anything from a tube or a bottle. It is such a simple thing that can spice up sandwiches and other dishes, and if you skip the step of poaching the shallots it is quiet easy and fast to make. Cut the shallots in half and put them in a pan (including the ones for the meat loaf). Cover them with oil, add a bay leaf, all the garlic cloves and the coriander seeds. 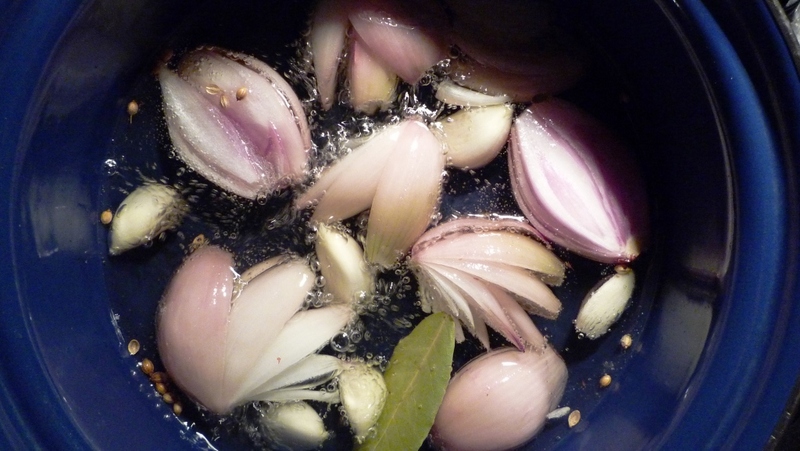 Bring the oil to a boil and leave it on your smallest fire until the shallots are soft. In a skillet bake the tomato paste until it smells sweet and add the tomatoes, the vinegar, the Worcestershire sauce, pepper, salt and sugar. Also add 4 of the poached garlic cloves and 2 shallots. Bring the sauce to a simmer and let it simmer until the sauce has the desired thickness. Blend it into a sauce in your food processor and set aside. Clean your food processor, put in the bread and add a little milk to soak it. Add the egg, the remaining shallots, the garlic and the bacon and pulse it into a coarse paste. Add this mixture to the meat and add 3 tablespoons of the ketchup, season with salt and pepper. Mix it good together and last, carefully mix in the berries. 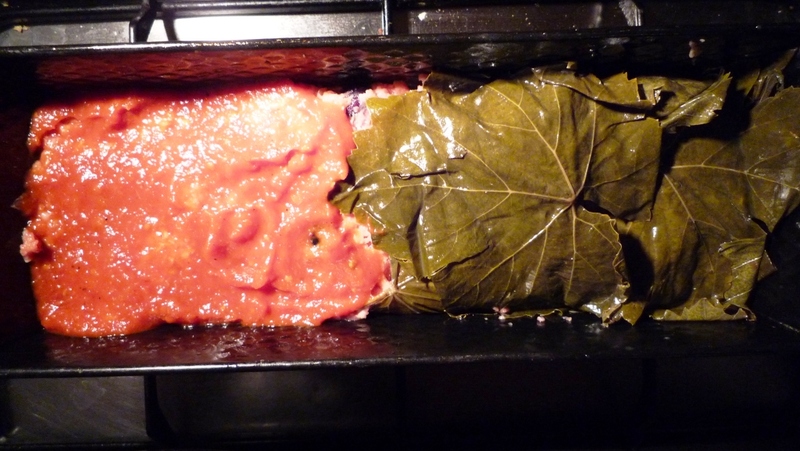 Grease a cake tin and cover it with vine leaves. 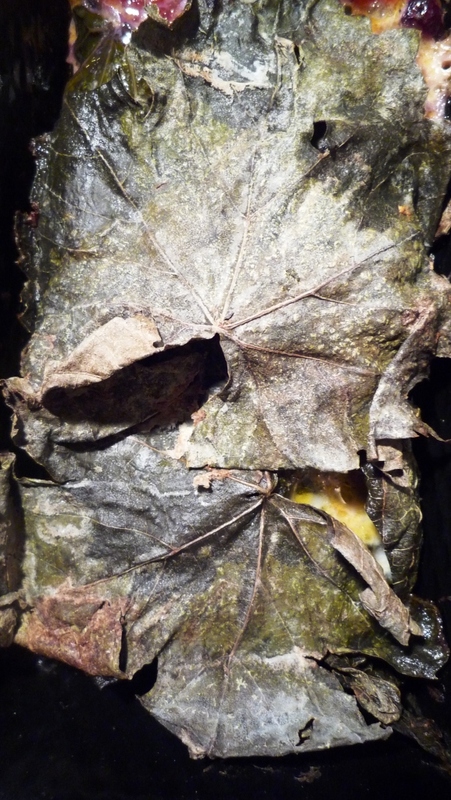 Put the meat in the cake tin and cover with more vine leafs. Don’t press the meat to hard so the texture will stay a bit loose, we don’t want to make a paté. Cover the leafs with the ketchup and bake on 180C for one hour. 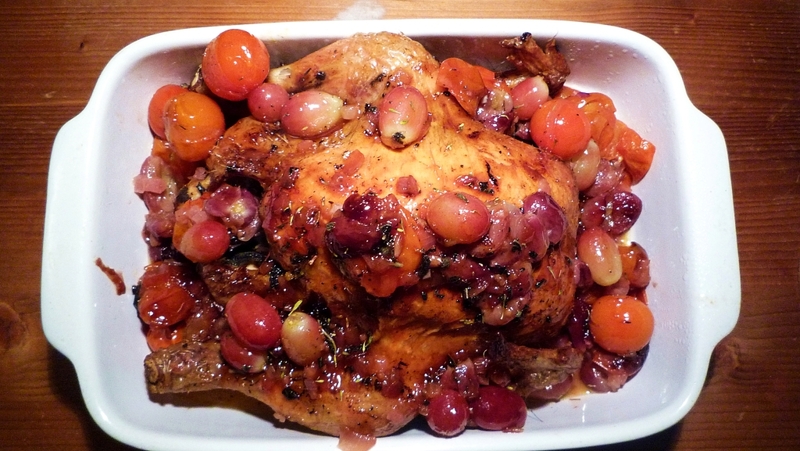 How to make a roast chicken with delicious juicy legs and soft breast meat? The problem with roast chicken is that the breast is done when the meat is 80 C but no more, and the legs are done when they are 95 C or above. If you put the entire chicken in an oven of 220C how are you going to get these two different temperatures right? The authors of the book cook & chemist did all the experimenting for me, I just had to test it for myself. Preheat the oven to 220 C.
There is not so much to it actually, it is a really simple recipe. Cut the onion in 4 parts and cut one of the parts small. Take the paper of the garlic cloves and crush one with a bit of salt and your knife. Wash the grapes and the cherry tomatoes. When the chicken is ready, take it out of the fridge and rub it with butter. Season with pepper and salt, fill the inside with the three onion part, the whole garlic cloves, the fresh thyme and sage and tie the legs together. Sprinkle the outside with a teaspoon of dried thyme and dried sage. Bind the hens legs together, butter the baking tray and place the chicken on it. Bake the bird for 20 minutes. Take it out of the oven and rub it again with butter and garlic. Poor half of the white wine in the tray and add half of the grapes and half of the tomatoes. Press the grapes a bit. Put the cut onion in the wine. Bake it for another 55 minutes (or until the breast and legs have the right temperature). Take the chicken out of the oven and place it on a serving dish. 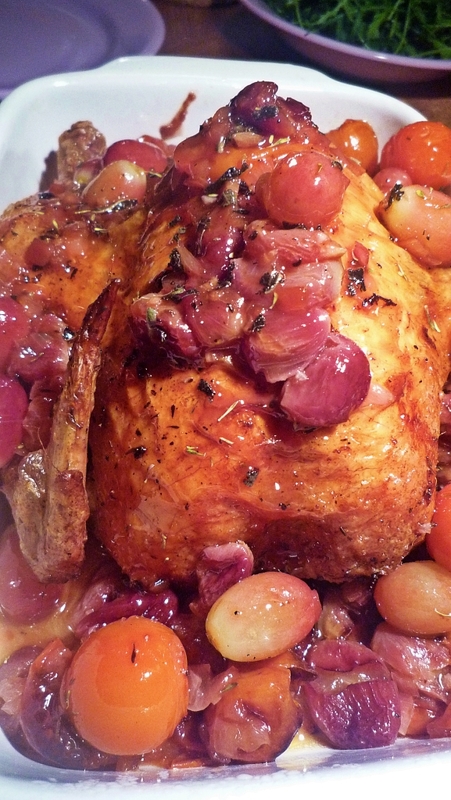 Arrange the grapes and tomatoes around the chicken. Cover it with aluminum foil. 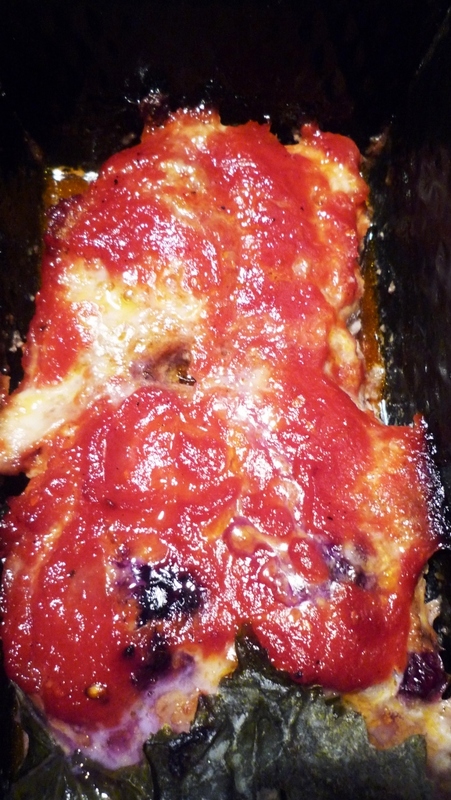 Poor the juices from the tray into a skillet and add more wine, also add the other half of the tomatoes and grapes. Add a teaspoon of honey, some dried sage and dried thyme and let the sauce reduce. Poor this sauce over the chicken and serve it like that.